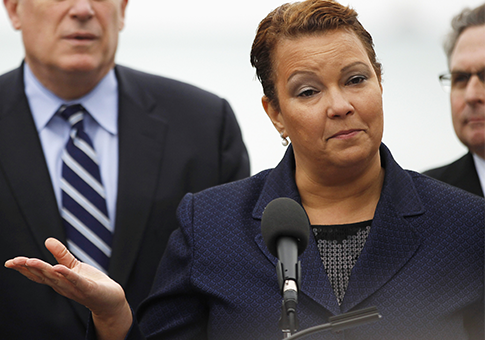 Former Environmental Protection Agency (EPA) Administrator Lisa Jackson used her private email to conduct official business, including with a lobbyist, in a possible violation of federal record laws. The emails were part of the latest batch of documents released through a Freedom of Information Act (FOIA) request filed by the Competitive Enterprise Institute (CEI). The conservative nonprofit has been digging through Jackson’s correspondence for months after it discovered she used a secret EPA email address under the pseudonym "Richard Windsor." Alison Taylor, a vice president for the multinational company Siemens, emailed Jackson's "Richard Windsor" account in December 2009 asking if Jackson "might be able to spare a few minutes to meet with Siemens' global sustainability officer (who is my boss) Barbara Kux." "She'd like to meet you and to express her support for your good work on climate," Taylor wrote. Jackson agreed. Shortly after, she sent a second email: "P.S. Can you use my home email rather than this one when you need to contact me directly? Tx, Lisa." At the time, Taylor was a lobbyist for Siemens. Siemens spent more than $5 million lobbying the federal government, including the EPA, in 2009, according to the Center for Responsive Politics. In another email chain between her and Sierra Club executive director Michael Brune, Jackson’s personal Verizon email address is redacted under a privacy exemption, only to be left unredacted a few lines later. If federal employees use their private email for business, they must send the email to their official government account for record keeping purposes. Jackson’s use of the secret "Richard Windsor" account riled transparency advocates and Republican investigators in Congress, who worried such practices skirted FOIA regulations. But the new evidence suggests that Jackson used a third, private email address. "There's no ambiguity here," said CEI senior fellow Chris Horner, who first discovered Jackson’s secret email account. "This reflects a clear intention to violate law and policy." In an interview with Environment & Energy Publishing, Anne Weismann, chief counsel for Citizens for Responsibility and Ethics in Washington, said the email between Jackson and Taylor was "extremely troubling." "I agree that was a very interesting line in there because it's clear that it was discussing agency-related business and this was someone that she knew in her capacity as administrator of U.S. EPA," Weismann said. "As difficult as it may be to capture all the emails that are sent or received when she uses [the Richard Windsor account], it's basically impossible to locate emails that are sent to or from a home email address." EPA political appointees were instructed by the Obama administration in 2009 to "not use any outside email account to conduct official agency business." The news is also drawing sharp rebukes from GOP lawmakers who investigated Jackson’s "Richard Windsor" account. "For months this Administration has brushed off transparency concerns, especially when it comes to federal record-keeping laws. EPA Administrator Jackson, aka ‘Richard Windsor', has been the biggest culprit," Sen. David Vitter (R., La.) said in a statement Wednesday. "Even with EPA's recent promises to review and revamp its email practices and policies, the mere fact that the agency's Administrator was trying to circumvent ‘sunshine' laws is a huge red flag for the effectiveness of the agency and the Administration," Vitter continued. "There is a statutory obligation to preserve and not destroy agency communications, and I hope that Ms. Jackson will take the appropriate steps to ensure all her communications during her time as head of the agency are properly preserved." Jackson resigned earlier this year in the midst of a congressional investigation into the EPA’s record keeping practices. The investigation uncovered more questionable practices among high-level agency officials. An EPA regional administrator resigned in the midst of a congressional probe after it was revealed he used private email to conduct business. When reached for comment, an EPA spokeswoman did not address Jackson’s email practices but pointed to the agency’s recent steps to improve its practices. "The Environmental Protection Agency is committed to adhering to the appropriate regulations and laws for both federal records management and email use," the spokeswoman said in an email to the Free Beacon. "EPA continues to work with the Inspector General in its review of EPA's email practices and policies, and is prepared to give full consideration to any recommendations for improvements identified in that review." An Associated Press investigation earlier this year found secret email addresses used by other top Obama administration officials, such as Secretary of Health and Human Services Kathleen Sebelius. Agencies and the White House defended the practice, saying it was common in previous administrations and necessary, given the large amount of email that flood officials’ public inboxes. Jackson did not immediately respond to request for comment sent to her private email address. This entry was posted in Politics and tagged Department of Energy, Federal Bureaucracy, Lisa Jackson, Obama Administration. Bookmark the permalink.